The World Tourism Organization (UNWTO) released its flagship publication “Tourism for Development” which provides concrete recommendations on how to use tourism as an effective means for achieving sustainable development. This publication, as key outcome of the International Year of Sustainable Tourism for Development 2017 (IY2017), addresses the changes needed in policies, business practices and consumer behaviour for tourism to effectively contribute to the 2030 Agenda for Sustainable Development. More than 180 people contributed to the publication in a global consultation with governments, organizations and civil society. Numerous country examples, further evidence, case studies and critical comments were incorporated, enriching it and making it representative of global views. 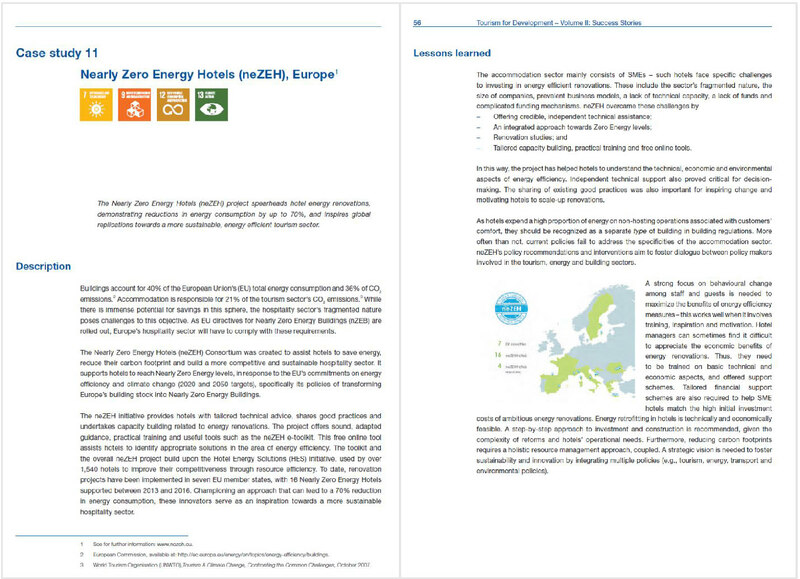 One of the showcases, contributing to the sustainable development of tourism in all its dimensions is the “nearly Zero Energy Hotels - neZEH” European initiative, coordinated by ReSEL-TUC and implemented by a consortium of 10 partners, including UNWTO. neZEH spearheads hotel renovations towards nearly zero energy, demonstrating reductions in energy consumption by up to 70%, and inspires global replications towards a more sustainable, energy efficient tourism sector. The case study of neZEH was included as an example contributing to three key areas of the IY2017: Pillar 1-Sustainable economic growth, Pillar 2-Social inclusiveness, employment and poverty reduction, Pillar 3-Resource efficiency, environmental protection and climate change.